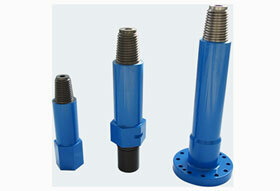 Drill collar is a component of a drill string that provides weight on bit for drilling. This kind of trenchless tool is a thick-walled tubular piece that is machined from a solid bar of steel, usually plain carbon steel but sometimes of nonmagnetic nickel-copper alloy or other nonmagnetic premium alloys. The solid bar is quenched and tempered to obtain the required mechanical properties, then trepanned, drifted and threaded. Located at the bottom of the drill string, drill collar is a major component of bottom hole assembly. The main characteristic of this trenchless tool is thick wall (It is generally between 38 mm to 53 mm and is equivalent to 4 to 6 times of that of drill pipe), larger gravity and stiffness. It is usually classified into spiral type, non-magnetic type and integral drill collars. Our company is able to supply 18T-800T drilling machines for both home and foreign drilling rig factories. Customers can choose the most appropriate trenchless tools according to their specific demands. 1. It provides pressure on drill bit for drilling. 2. It can guarantee the necessary strength under a certain compression condition. 3. Drill collars can reduce the vibration, swinging and beating of drill bits, making the drill bit work smoothly. 4. This type of trenchless tool can control well deflection or well deviation. 1. They can be selected that are as wide as possible and installed in the lower section, leaving enough space between the collars and the borehole walls to permit debris and drilling mud to pass. 2. A stabilizer or reamer may be installed in the drill collar assembly. 3. Blades can be welded to this trenchless tool so that its diameter is nearly the same as the borehole diameter. 4. The diameter and the male and female ends of the drill collars need to be monitored as they are more exposed to wear. Wuxi Geotec Geological Equipment Co., Ltd. is a professional manufacturer and supplier of trenchless tools in China. Through over 20 years’ production experience, marketing and service experience, we have gained the recognition of a large number of clients both home and abroad. In addition to drill collars, our company also provides HDD drill pipe, saver sub, drill bit, pulling swivel, hoisting plug, cutter head, drill reamer, and so on. Our products have obtained ISO9001:2000 authentication for quality management system and member certificate of China Mning Association. Our trenchless tools have been widely exported to America, United Kingdom, France, Canada, Australia, New Zealand, Indonesia, India, Russia, Malaysia, Thailand, Mongolia, Pakistan, etc. If you want to buy our drill collars, please contact us freely.